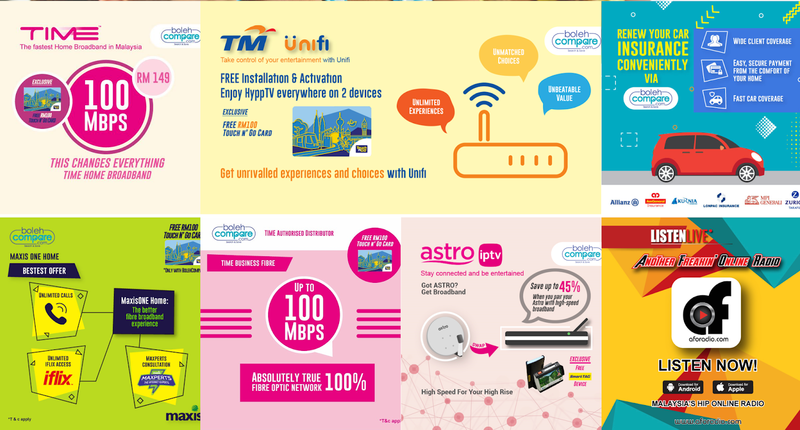 I've been hearing a lot about Bolehcompare.com lately, but the real question is, what does it compare? I decided to do a little research on how it can improve your lifestyle by simplifying your financial comparison struggles through a website. BolehCompare.com claims to be the most comprehensive financial comparison service in Malaysia and are committed to helping you find the right product at the most competitive price while saving your time and money. 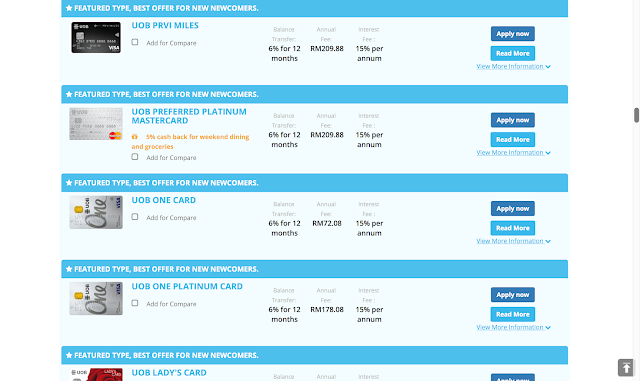 With that in mind, im pretty sure you'd like to know more about what BolehCompare.com offers? Scroll down to find out more! 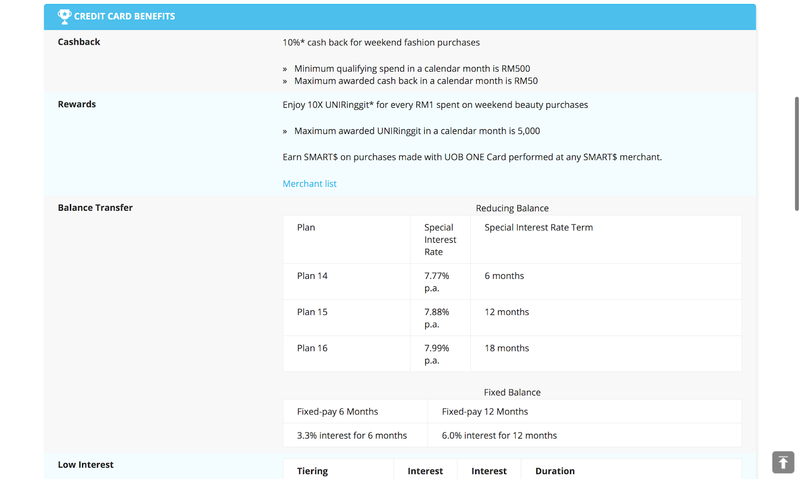 Just a quick recap, lets put BolehCompare.com as your assistant in making decisions, without the need to pay a monthly fee. If you're looking for guidance on banking, insurance, and mobile & broadband products, you can now take control of your financial wellbeing and improve your financial standing through BolehCompare.com. 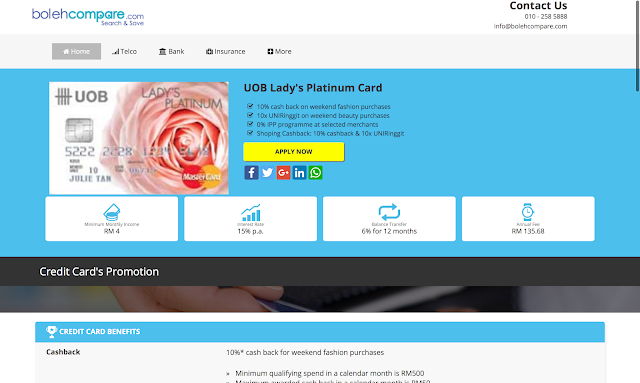 The site offers quick and easy access to help you understand various financial products in Malaysia with a detailed and customizable comparison tables to help you get access to easy-guides, frequently asked questions and topical articles in exploring ways to make money. Looking for a Credit Card for the first time? So, being in my mid-twenties with a good paying job, it's pretty obvious that I need to get myself a credit card. Haha. I mean, not to spend but to save on credit card deals when I purchase my everyday necessities at a discounted price. 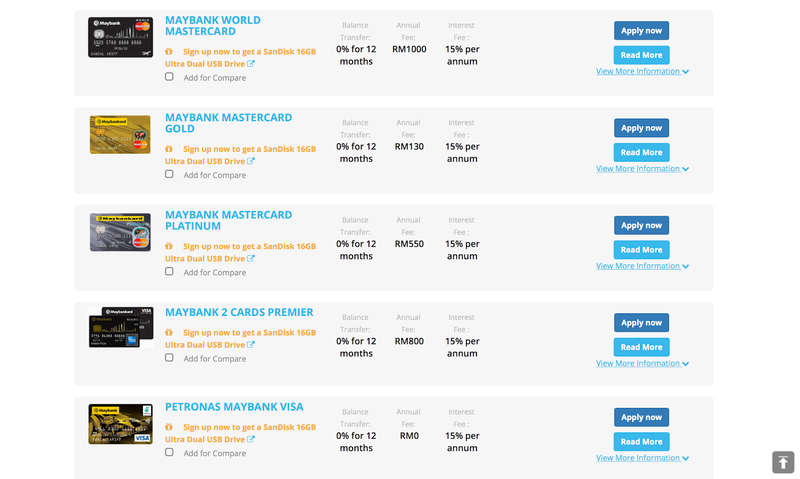 And the thought of getting a credit card also means = annual fees to commit too. (Sigh!) Don't get me started on the amount of research that you need to do before deciding on the right credit card to sign up for. 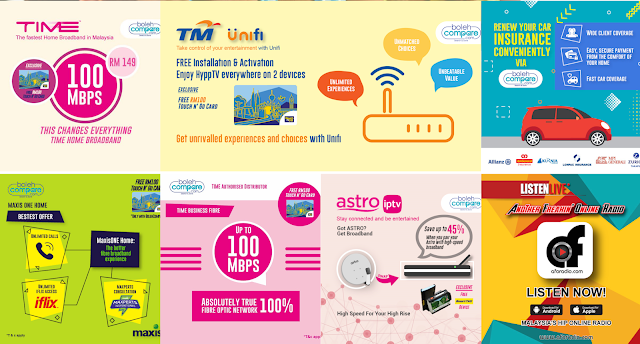 This is where BolehCompare.com comes in! 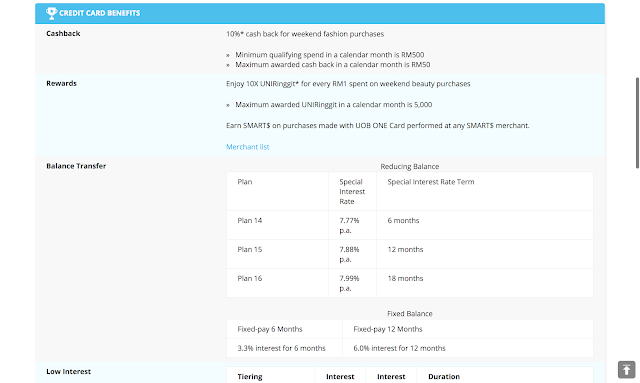 Instead of you going through all the bank providers to manually compare their benefits, annual fees, and services, BolehCompare.com saves you all the time by compiling the information that you need within a few clicks! You can choose your preference of credit cards to cater to cash back offers, travel, low interest, annual fee, petrol savings, dining, rewards, or online purchases then you can leave the rest to BolehCompare.com. 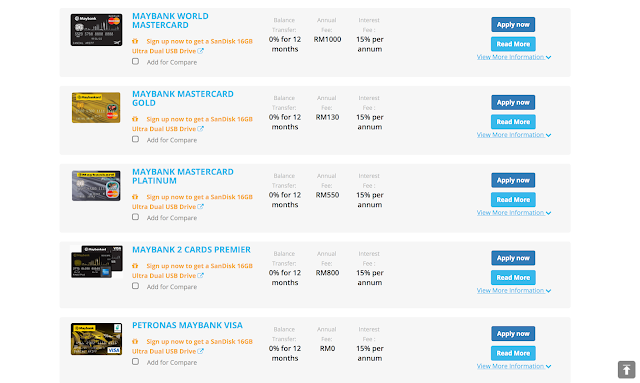 So, when I decided to get myself a credit card, believe it or not, there were 101 cards to go through and BolehCompare.com has conveniently arranged the amount of the balance transfers, annual fee and interest rate for each credit card for easy comparison. WOW! And as you scroll below to see more options, you'll find yourself at the featured best offer for newcomers that pretty much offers the best deals for young people like me. (I like to think of myself as young) hehe. 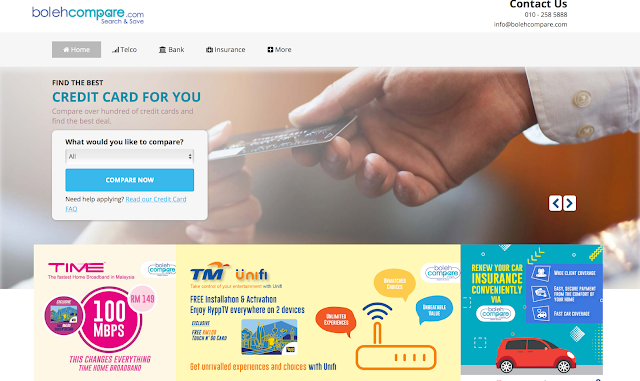 Other than credit cards, BolehCompare also compares other needs such as Broadband, Postpaid plans (Phone Bundle and Sim Only), Home loan, Personal loan, Medical and Motor Insurance and hopefully more in the future! With BolehCompare.com, consider the site as your financial consultant, just that you won't need to feel pressured to make decisions. 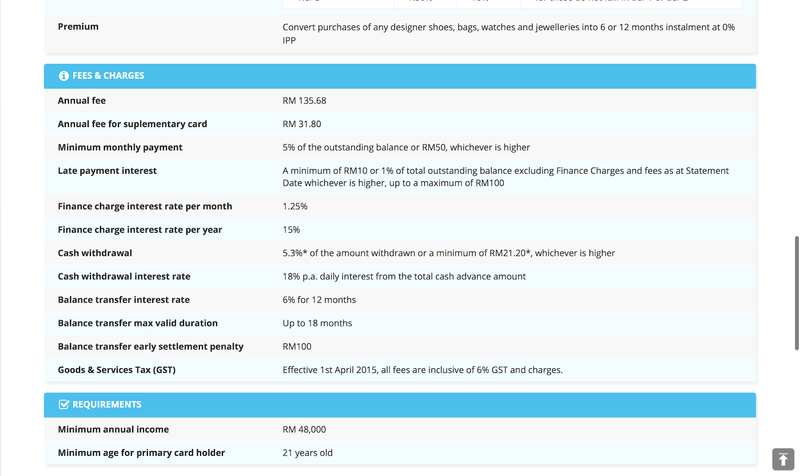 So to those who need to learn how to adult, BolehCompare.com seems to be the perfect way to start adulting for beginners. To lovers of music, im pretty sure that you would know that JOOX is a music streaming service which was launched in 2015 to be the biggest music streaming app in Asia, currently covering Hong Kong, Indonesia, Malaysia, and Thailand. What's even better would be that they are doing a great cause to give back to the needy this Ramadan season by being involved with local celebrities to visit an Orphanage. In this collaboration between JOOX and the local celebrities, they have worked hand in hand to make the 'JOOX Rasa Sayang' program a success being it the first series during this fasting month in 2018. The celebrities who were present for this program were Wani Kayrie, The 4aith, and Putera Muhammad. In case you're wondering, this welfare program has been introduced by JOOX Malaysia, is it the 2nd time happening in Malaysia. 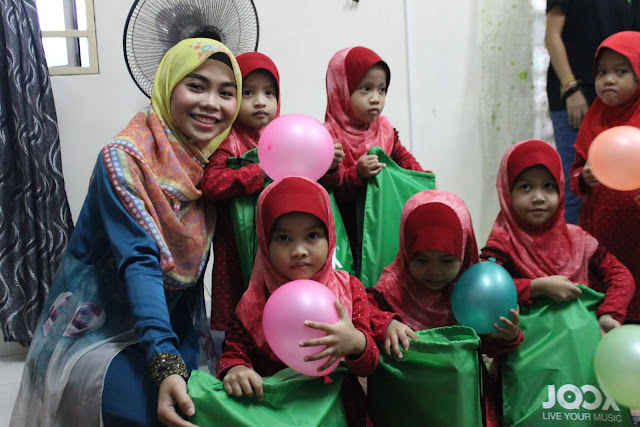 On the 31st of May, local celebrities and JOOX visited the Islam Buah Hatiku Orphanage in Semenyih to give them the festive vibes of Ramadhan by showing them, extra love. For your information, 24 out of the 30 children from the orphanage are between the age of 2 to 6 and the other 6 are in their seventeen's. During the program, the invited celebrities managed to entertain the children by sharing with them stories, had recreational activities, and also got a chance to sing along together. To make the occasion even more memorable, the singers took the opportunity to break their fast with the children. Not to forget, these lucky children did not leave the night empty-handed as JOOX took the change to provide them with stationaries and a water bottle to each of the children too! If you would want some sneak peaks on the program, you can catch some behind the scenes of the program through the JOOX e-Beats. During the interview session with the celebrities, they mentioned that they were really happy to be given the chance to be a part of the program as it made them felt happy and touched to be a part of these children's life. They also shared that experiences like this are not to be missed as it would be cherished for a very long time. Let's hope for more activities like this would happen more often! 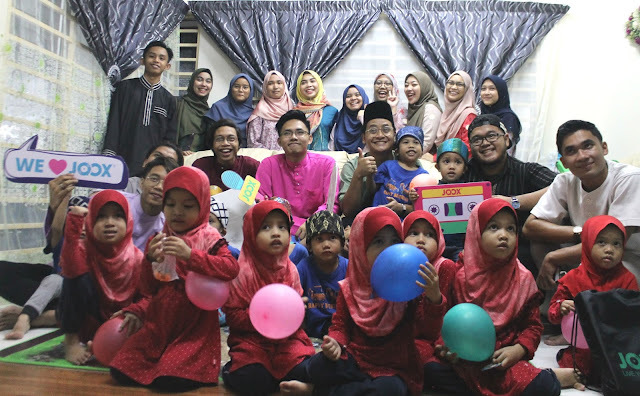 The 'JOOX Rasa Sayang' program is the first in 2018, and they plan to visit the disabled, old folks home and more with local celebrities from different states. I personally think that this is a program by JOOX Malaysia that I truly support which has so much meaning to make a difference to a person's life. Im hoping to see more similar programs by JOOX as they set good examples to other companies to care for those who are usually not in mind. Through this program, I think that they have shown us that it's not hard to give back as your attention would mean more than a diamond to some people. Hey guys, in case you haven't heard, there's this new store selling evening gowns which looks Ah-Mazing. 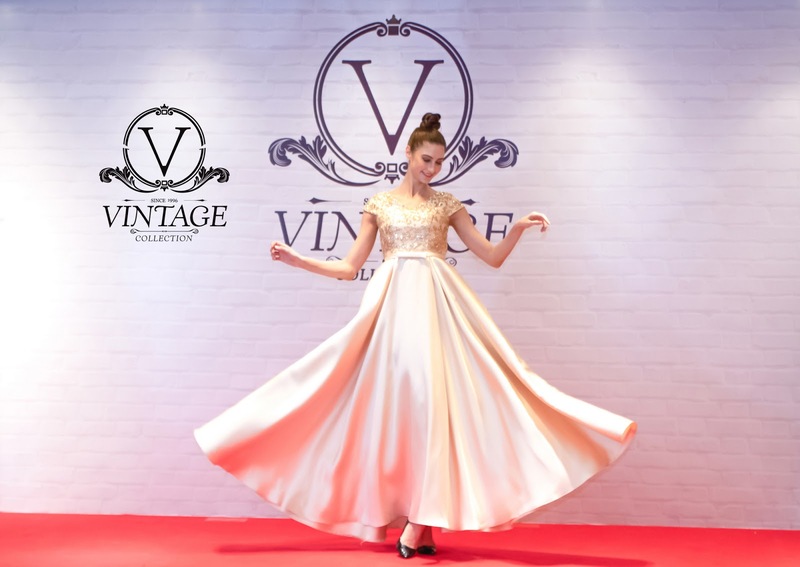 So if you're looking for dresses for prom, for pageants, a wedding, or simply for a special occasion, its time to keep your eyes on track with Vintage Collection International which just recently opened in Sunway Giza Shopping Mall. They have been customizing various types of elegant evening gowns since 1996 and has been known to create unique styles of evening gowns for executives and socialites. Scroll to find out more! Being present at the opening ceremony, I was given the privilege to witness international models all dressed up in Vintage Collection International's evening gowns walking through the runway. I was really impressed with the details and the designs, which seemed very elegant and effortless. Imagine giant bows, sequins, and material that represented luxury to create evening dresses that would highlight a women curves. At the runway, the dresses were exquisite and glamorous that it even made me felt like I was under-dressed. LOL. And I thought I was already dressed up for a fashion show. During the launch, I was told that each piece of evening gown was carefully matched by Anna, the fashion designer, from the materials, diamond ornaments and handicrafts which were individually selected to ensure that the quality is at its finest. 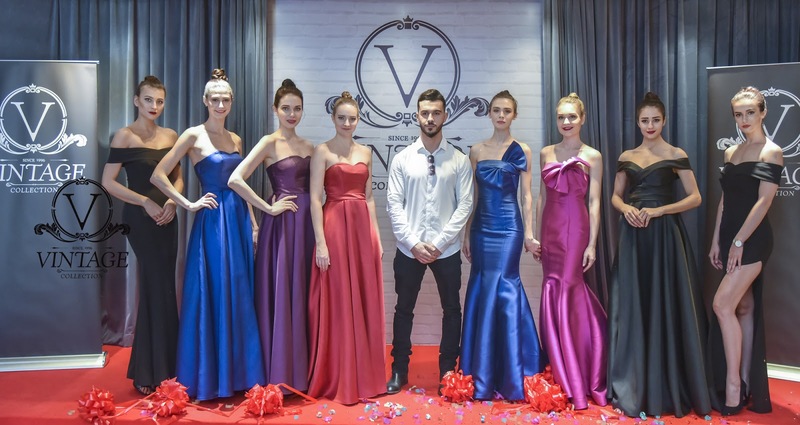 The brand focuses more on creating elegant evening gowns that would be launched to the market with one design in a vast array of colors, primarily to cater to socialites with different color preferences. Present during the launch, we had the marketing manager of Vintage Collection Internation, Ms. Samantha who shared that customers who are interested in having a fitting session, they can always make an appointment before their visit for a fashion consultant to provide a perfect experience of gown selection. Vintage Collection International aims to live up expectations of audiences and release seasonal collections that would deliver satisfaction to the wearer of the collection. Other than evening gowns, VIntage Collection International also provides gorgeous evening gowns rental services to the public as well. Not to forget if they would like to seek for make up services and hairstylists, and even services such as professional photographers for various types of occasions, you can request from Vintage Collection International. Just something to keep in mind, the boutique displays limited edition of famous designer bags, foot apparels, and precious jewelry from time to time, to give socialite the convenience to shop and boost up confidence. 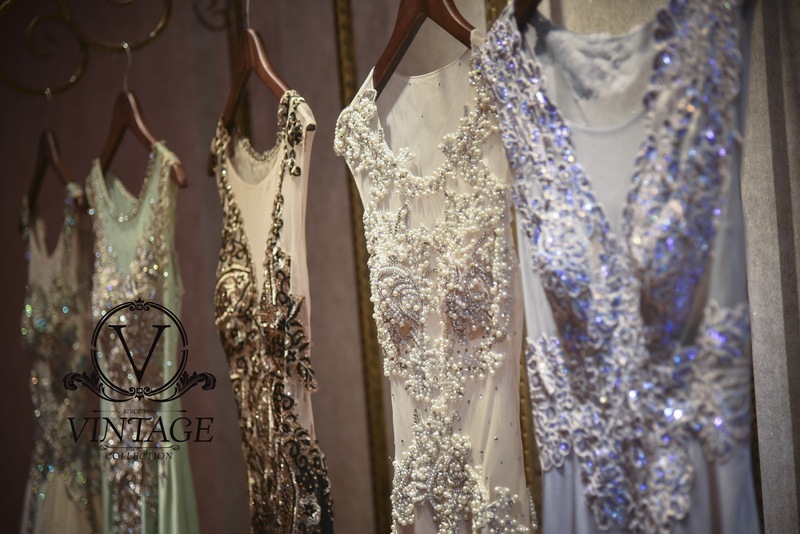 So if you're looking for exclusive custom dresses or ready to wear pieces, you can always check out Vintage Collection International in Sunway Giza Mall. 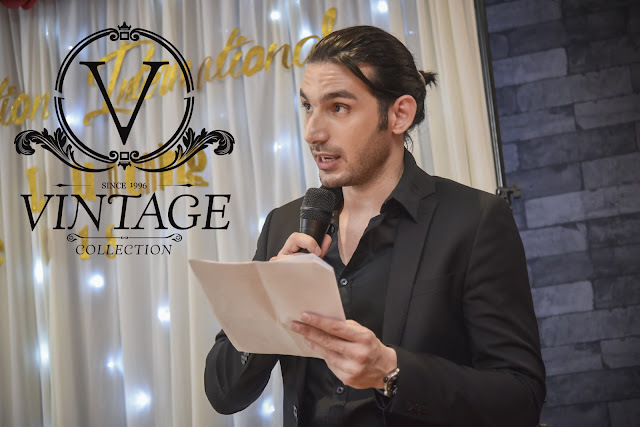 Alternatively, if you're looking for more details on services by the professional team of Vintage Collection International, you can contact the marketing manager, Ms. Samantha at 012-221 9138 for more information. I've listed their business details at the end of this post, so feel free to call them and inquire if you have any further questions. For gown fitting by appointment only . Its still not too late to enjoy a spectacular buffet spread as Four Points by Sheraton Puchong has got your Raya cravings covered. Offering a themed spread according to 'Warisan Sajian Juadah', to those who are in the #TeamRayaKL, well why not enjoy your last few days of fasting at Four Points by Sheraton Puchong as they are offering a great buffet deal at less than RM100 per pax at the eatery. To be specific, from 10th June to 14th June, the rates are at RM78/adult and RM39/child. Trust me, its a deal not to be missed if you want to treat your family or friends with a nice buffet spread in Puchong. Because I enjoyed my buffet at Four Points by Sheraton Puchong about a week ago, I'll be sharing with you the buffet spread menu, and on food that you can expect to be served. I was also told that the buffet spread shuffles from time to time so that their guest can enjoy more varieties on different days, so if you want to be EXTRA sure, there's no harm giving them a call to ask. But since I know some of you might be interested in what made me felt so impressed with the buffet spread, well, let me share you the details. For appetizers, we had a huge variety of Kerabu, Ulam, Salads and more. To start off with the kerabu section, the spread offers kerabu batik Muda, spicy chicken and angle bean salad, a car jelatah, kerabu telur, kerabu makanan laut and with condiments such as salted fish and salted egg to tingle your taste buds. They also had lemon with chicken or beef serunding, but what made it extra special was that they provided both options of enjoying lemang pulut Hitam or lemang pulut Putih. This was actually the first buffet this year that included lemang in their menu, and trust me, my Malaysian cravings were satisfied! They even had Roti John to offer in case you want a taste of the simple delicacies. Moving forward to the mains, the spread offers a Malaysian spread to satisfy Malaysian tastebuds with the combination of Chinese cuisine, Malay cuisine, and Indian cuisine. Being mixed blood myself, this was like a dream to enjoy all the different varieties. Just to name a few of the Chinese dishes which were available, we had the Loh Hon Chai, Steam Fish with Sauce, Homemade deep fried and fresh popiah, fried yee mee, yong tao foo, chee Cheong fan and one of my favorite Chinese soup, the lotus root chicken soup. YUMS! I must say that the Malay spread took over the spotlight with tons of Malay favorite dishes to enjoy in conjunction with the upcoming festive season. The menu offers Young Jackfruit with salted fish, sliced beef with sauteed chili, deep fried chicken with Malay spices, catfish with fermented king fruit (tempoyak), lamb curry, squid with turmeric and vegetables, and the must-have, kambing bakar! Even before everyone broke their fast, the line for the lamb was already building up, but definitely enough for everyone. And to those who are craving for Indian cuisines, the spread offers Kurma Kambing, Fish Head Curry, Ayam Masak Kicap, and more! I would list the whole menu, but that would just be a long post on the menu. Hehe. Also, not to forget their grill section, they had grilled prawns and grilled baby squid being prepared right before your eyes. Honestly, I enjoyed the grill because it was not overcooked, and the griller was well experienced in ensuring that the food is not too dry. If that is not enough, they have more food to offer which leads to the outer part of the restaurant which had more variety to choose from. They had satay, sup tulang, steam and roasted chicken rice, and assorted noodles which are prepared fresh. At times like these, I wish I had more than one stomach because everything just looks really good. I kid you not! Scratch the typical commercial buffet meals, and get a taste of real food prepared by a chef who really knows his stuff. Im impressed! Whats a buffet spread without desserts! In the dessert section, i can confidently say that there would definitely be something that would satisfy your sweet cravings, offering black glutinous rice with coconut, banana in coconut milk and palm sugar, fresh fruits, festive cookies, dodol, pudding, cakes, the classical ice kacang, and ice cream! I had a good time picking out my favourites while trying some new things in this section of the buffet. Just talking about it makes me wish that I had another round of sweet delights. When will you visit Four Points by Sheraton Puchong? And there you have it! Today making the last 5 days of Puasa, its time to make your reservations at Four Points by Sheraton Puchong and enjoy the buffet spread with your friends, family and loved ones to have a memorable Ramadhan month. I spent the night with my family, and I believe everyone enjoyed the meals served at The Eatery. If you're looking for the real deal buffet, I would definitely recommend you to check out Four Points by Sheraton Puchong as I really enjoyed the food spread. Hehe. In case you want to make immediate reservations (before its too late), I've left their contact details below for your convenience. If you've enjoyed their buffet already, do leave me a comment by telling me your favs!